Discover the fascinating behind-the-scenes stories and lasting impact of the trailblazing sketch comedy show that upended television, launched the careers of some of our biggest stars, and changed the way we talk, think, and laugh about race: In Living Color. Few television shows revolutionized comedy as profoundly or have had such an enormous and continued impact on our culture as In Living Color. Inspired by Richard Pryor, Carol Burnett, and Eddie Murphy, Keenen Ivory Wayans created a television series unlike any that had come before it. Along the way, he introduced the world to Jamie Foxx, Jim Carrey, David Alan Grier, Rosie Perez, and Jennifer Lopez, not to mention his own brothers Damon, Marlon, and Shawn Wayans. In Living Color shaped American culture in ways both seen and unseen, and was part of a sea change that moved black comedy and hip-hop culture from the shadows into the spotlight. 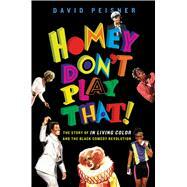 Now, Homey Don’t Play That reveals the complete, captivating story of how In Living Color overcame enormous odds to become a major, zeitgeist-seizing hit. Through exclusive interviews with the cast, writers, producers, and network executives, this insightful and entertaining chronicle follows the show’s ups and downs, friendships and feuds, tragedies and triumphs, sketches and scandals, the famous and the infamous, unveiling a vital piece of history in the evolution of comedy, television, and black culture.